There are so many friends from my generation, and a couple of generations after, who used to be sassy as bachelorettes — defying gravity, rules and societal norms. Rebels, actually, with a cause: to do their own thing and stand out from the rest of the herd. But as the big day approached, coyness and adherence to traditions suddenly took over, hijacking the nuptials and all that which lead up to it. Stepping into the age of marriage, they go a step further or backward if you like. They wanted the whole package, and then some: week-long events involving the traditions of their faith, community and region. Some even went to the extent of resurrecting rituals and traditions which had been offloaded by previous generations. I suspect that the wedding-as-theatre was really meant for all their foreign friends from university in Europe or North America — or colleagues at work — who descended on India for the Big Fat Indian Wedding. Pundits were told to go the whole hog. Keeping up with the times, and no doubt with the international guests in mind, the parents printed little booklets with translations of the Sanskrit words the pundits used in Hindu weddings. Priests often did translations for the benefit of the pardesis. Mehndis became elaborate affairs, for the groom and the young men in the wedding party as well. Both the groom and the bride played the part, and the bride pretended to be coy. Just like in the movies. Zoom to today. An increasing number of brides are shedding the veils of traditions and modesty. It is the age, however transient and limited, of the unconventional bride. The shy bride with lowered eyes and weighed down by all the bridal jewellery and heavy saris or chunnis covering her painted face is so yesterday. The growing tribe of ‘avant-garde’ brides has begun to ignore the elders and conceptualise, design and organise their own weddings. The brides drop a few old customs and concoct a few new ones. Why, she may even wink at the groom, unencumbered by those veils of modesty dictated by convention and tradition. A couple of years ago I came across a woman who made intricate henna designs on the palms of brides. She has still not got over the young woman who asked her to draw ‘scenes’ (positions if you like) from the Kama Sutra. The bride-to-be showed her risqué drawings from the book she wanted her to copy. These days it is not so uncommon: presumably the bride and groom might either learn from the big book or chuckle over it during what is supposed to be their ‘first night’. Brides now curate their own weddings, write their own scripts, as it were, for what is supposed to be the most important day of their lives. They don’t want to be cookie-cutter brides. While surfing the net for some enlightenment about blasé brides I came across the blog, vlog actually, of a bride. There she was with a heavily embroidered and glittering choli, her arms laden with red bangles, her ears downward bound with pendulous earrings. But, below the waist was another story. There was no sign of a sari or lehnga: she was wearing white shorts and dancing with abandon at what I suppose was a sangeet taking place by a pool. It is no longer rare to see brides not only script their wedding but play leading ladies. A few are glamazons with an edge who may even ditch the fancy sandals and heels for ultra-cool sneakers (jazzed up naturally with glitter). Or, even the Sabyasachi-Christian Louboutin leather and suede shoes with the latter’s signature red soles. It’s becoming a mix-and-match affair — or non-matching as the case may be. Bustiers with saris, evening gowns, separates, jumpsuits and sleeveless cholis to flaunt gym-toned muscles are the new règle du jeu. The determinedly acquired muscles make a louder statement of one-upwomanship than the longest pair of kundan earrings or a gold necklace which resembles a medieval warrior’s shield. The unconventional bride is all about wearing her individuality on her sleeve, besides flaunting her creativity. What is making her do this? Perhaps she is taking her cue from the red carpet events like the Oscars, Cannes, Golden Globe Awards and their imitators (not to mention lifestyle magazines and both Bollywood and Hollywood publicised soirees) for her sartorial choices. However, the reasons for being in charge of her own wedding — beyond just what she wears and how she behaves — are to do with the changing position of women. Women with impressive degrees — MBAs from premier institutions, degrees from top medical schools in India and overseas — and heiresses who inherit not just the money but a place at the top of the hierarchy no longer want to play second or third fiddle. An increasing number of women are bosses in their workplaces. Many establish and run their own businesses or are CEOs in major corporations and banks. They are even flexing their muscles in the political arena. And often, they bring home the bacon. So, not only are the veils becoming sheer or disappearing, coyness is no longer an attribute to be admired. Being demure is so over. 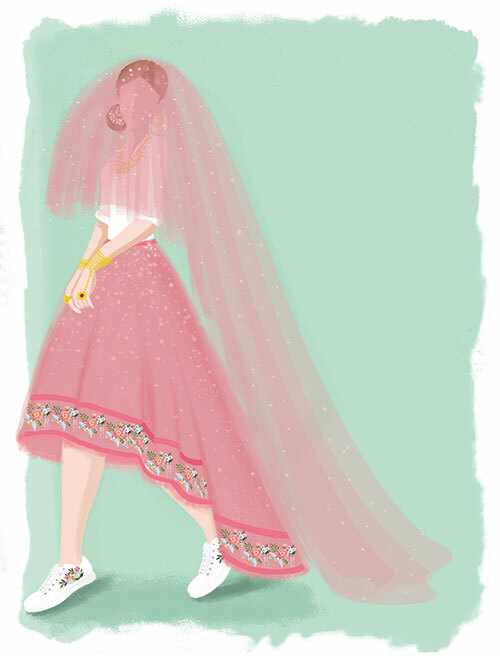 State Of The Union: Do Present-Day Weddings Have To Be Unconventional To Be Cool?